IOTA market had been moving downward for about two weeks now; posting a new year high at $0.38 before the sell-off. 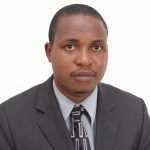 After touching a close support yesterday, the token encountered a bounce up which is yet to make a significant rise. At the moment, IOTA is down by 2.03% with a trading price at around $0.317 level. 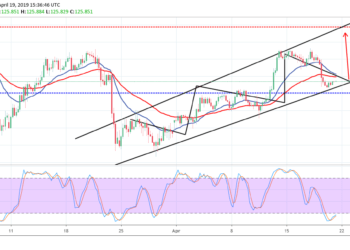 Following a bearish sentiment, IOTAUSD has been moving within the range of a descending channel for the past ten days after a sharp drop. The decline move is revealed on the 4-hours RSI. Yesterday, the token tested $0.3 support level, where the lower trend line rest. Now, buying pressure is slowly compounding up. A push could propel price to the $0.35 resistance level, respecting the upper trend line. 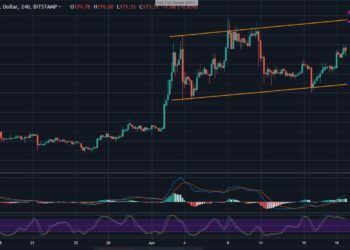 A possible price break above the channel is likely to send IOTA to the next bullish move. A significant break low may slump price to a bearish condition. The key support level is $0.28. Looking at the 4-hours Stochastic RSI, the buying pressure is approaching the overbought zone. 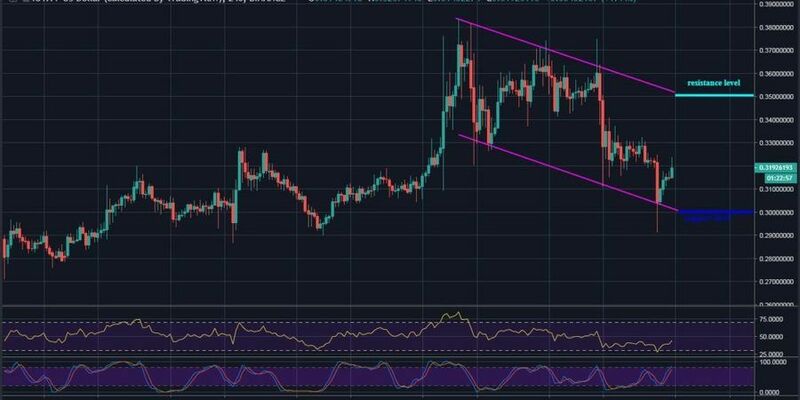 However, the descending channel remains a diagonal support and resistance lines for IOTA market. 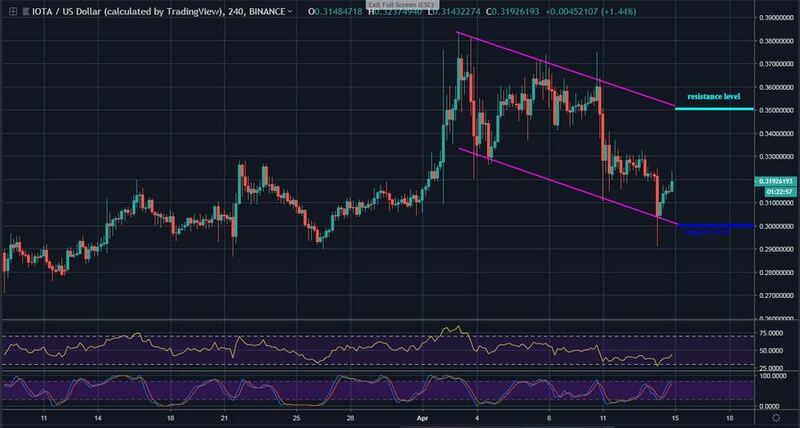 After April opening, IOTA trend on a lower high, lower low formation as price action remains in a descending channel. Still, on the bearish move, the market is currently at an indecisive stage with choppy price action. A close support for a drop may be located at 5500 SAT level and below. As suggested on 4-hours Stochastic RSI, the token is now at the overbought zone; a potential fall is around the corner. Since the bearish scenario began, the RSI has been trading below 52 level. 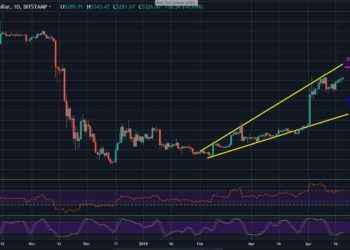 If the bulls manage to surpass the mentioned level o the RSI, a strong buying pressure could possibly reverse trend upward. The nearest resistance level to watch out for is 6500 SAT. 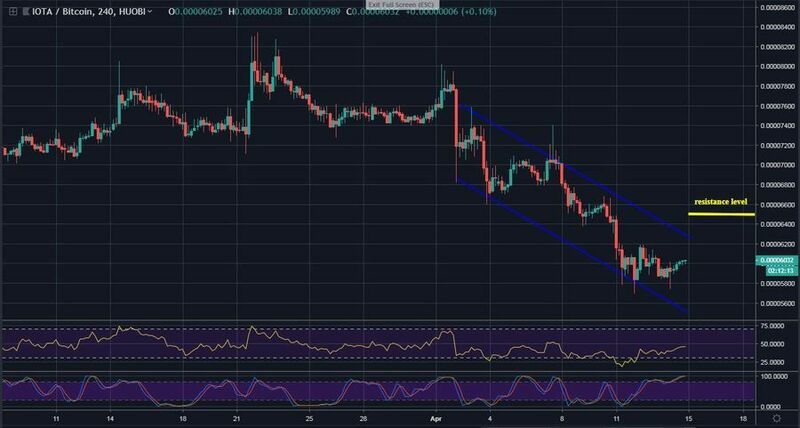 A successful trade above the channel could fuel IOTABTC for a bull-run.